A Serbian Easter feast wouldn't be complete without a platter of sausages, cured meats, roasted peppers, cheeses, ajvar (eggplant-pepper spread), kajmak (unripened cheese), pogacha (white bread), and red wine. But the real centerpiece is a spit-roasted barbecued lamb. (The best way to eat this delicacy is with your fingers.) If barbecued lamb isn't available, roast leg of lamb or roasted lamb shoulder are the next most favored cuts of meat. The meal is rounded out by sarma (stuffed cabbage), burek (cheese pies), cevapcici (sausages), Easter bread, salads, potatoes or rice, vegetables, and desserts like nut roll and krem pita (custard-filled pastry), with strong Serbian coffee served Turkish style. 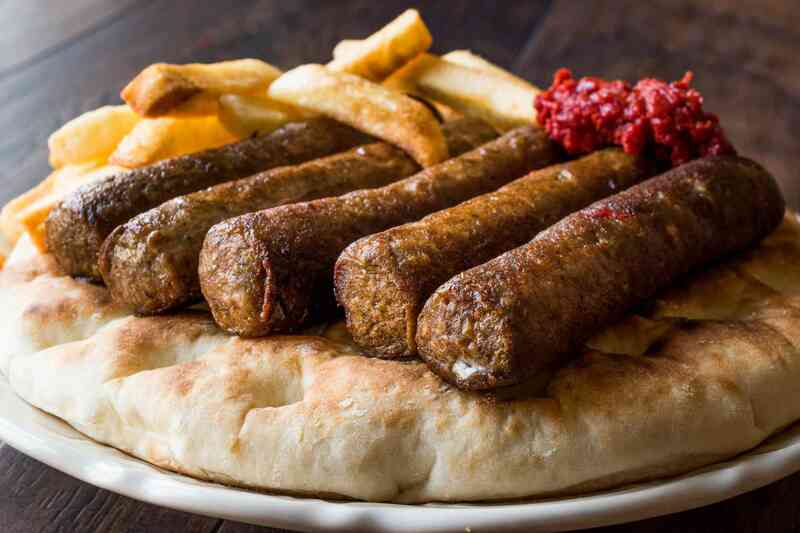 These sausages made of ground lamb, beef, and sometimes pork are great as a main course or appetizer with ajvar (see below) and lepinje flatbread. Cevapcici is not smoked and the meat is not stuffed into casings. Instead, the mixture—flavored with plenty of garlic—is formed into log-shapes by hand. Sometimes referred to as vegetarian caviar, this roasted eggplant and pepper spread can be used as a condiment or eaten as a vegetable dip. It is also delicious spread on pogacha (white bread) or lepinje flatbread. Depending on your taste, you can mash it until smooth or leave it chunky. Kajmak is a fresh, unripened cheese that is eaten as a spread on pogacha, a white all-purpose bread. The traditional method calls for unpasteurized and raw milk, which is no longer readily available. This recipe uses feta cheese instead, combined with sour cream and cream cheese to achieve a similar flavor and texture. Pogacha is an everyday white bread eaten with cheese and kajmak and is used for sandwiches and to sop up every last bit of soup, meat juices, or gravy. Its fine crumb is surrounded by a soft crust, and although it can be made into any shape, a round is traditional. Burek are filo pies filled with cheese or meat that can be eaten as a main course, or when cut into wedges, an appetizer, which is a great addition to the Easter buffet table. Layers of buttered filo dough are filled with a combination of cheeses. Burek can be round, horseshoe-shaped, or rolled up like cigars. It is the meaty lamb bones that give this creamy, lamb vegetable soup its rich taste. The vegetables can range from household to household, but peppers, onions, and tomatoes are very common. The creaminess comes from egg yolks and sour cream. Spit-roasted lamb with its crispy skin is a real delicacy and hard to come by in some communities. So you can substitute with roast leg of lamb if need be. The flavors of garlic, lemon juice, and herb give the lamb a fresh and vibrant taste. Just be sure to use a meat thermometer to assure it is cooked perfectly. Serbian stuffed cabbage rolls, known as sarma, add another dimension to the Easter offerings. Cabbage leaves are stuffed with beef, pork, rice, and seasonings and then baked on a bed of cabbage and sauerkraut with smoked ribs and tomato sauce. Sarma is a hearty dish that freezes well. This moist Serbian nut roll is a star on any Easter sweets table. The yeast dough is filled with a nut-sugar-milk mixture, rolled up, baked, and sliced. You can dust with powdered sugar if desired.